CANTON, MA (June 2, 2014) – Dunkin’ Donuts, America’s all-day, everyday stop for coffee and baked goods, continues to expand its menu to offer a wide variety of all-day options for on-the-go guests, today unveiling the new Grilled Chicken Flatbread Sandwich. A permanent addition to Dunkin’ Donuts’ sandwich lineup, the freshly made-to-order Grilled Chicken Flatbread Sandwich features lean, juicy grilled chicken, ancho chipotle sauce and reduced fat cheddar cheese, served on a multigrain flatbread. At 360 calories, Dunkin’ Donuts’ Grilled Chicken Flatbread Sandwich is also the latest addition to the brand’s DDSMART® menu of better-for-you items. Dunkin’ Donuts’ multigrain flatbread, with 16 grams of whole grain, has earned the Basic Stamp from the Whole Grains Council. The Grilled Chicken Flatbread Sandwich is available nationwide at participating Dunkin’ Donuts restaurants beginning today. Dunkin’ Donuts’ Grilled Chicken Flatbread Sandwich follows the brand’s introduction last year of two new chicken sandwiches. Dunkin’ Donuts’ Barbecue Chicken and Bacon Ranch Chicken Sandwiches are made with a tender, lightly-breaded chicken breast topped with cheddar cheese, barbecue or ranch sauce and served on a French roll. Dunkin’ Donuts’ Bakery Sandwich varieties also include Ham & Cheese, Turkey, Cheddar & Bacon, Chicken Salad, and Tuna Salad sandwiches, available on a French roll, bagel, or croissant, as well as Chicken Salad and Tuna Salad Wraps. All bakery sandwiches are served oven-toasted and made-to-order all day long at participating Dunkin’ Donuts restaurants nationwide. 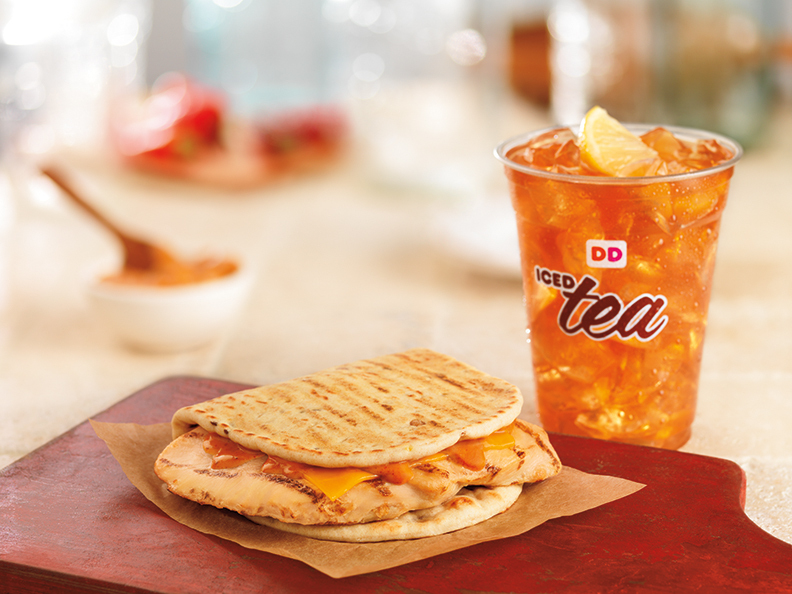 June is National Iced Tea Month, and for a perfect accompaniment to Dunkin’ Donuts’ new Grilled Chicken Flatbread Sandwich, Dunkin’ Donuts restaurants nationwide serve freshly-brewed Iced Tea. A crisp, cold and convenient beverage choice any time of day, Dunkin’ Donuts’ delicious Iced Tea is made-to-order, unsweetened or sweetened, with or without a fresh lemon. Earlier this year, Dunkin’ Donuts launched Iced Green Tea, as well as a cool and unique variety of fruity Iced Tea flavors, including Blueberry, Raspberry and Peach.